I usually bake two smaller meringue circles instead of one large. This one is filled with rasberries and dark chocolate chips. 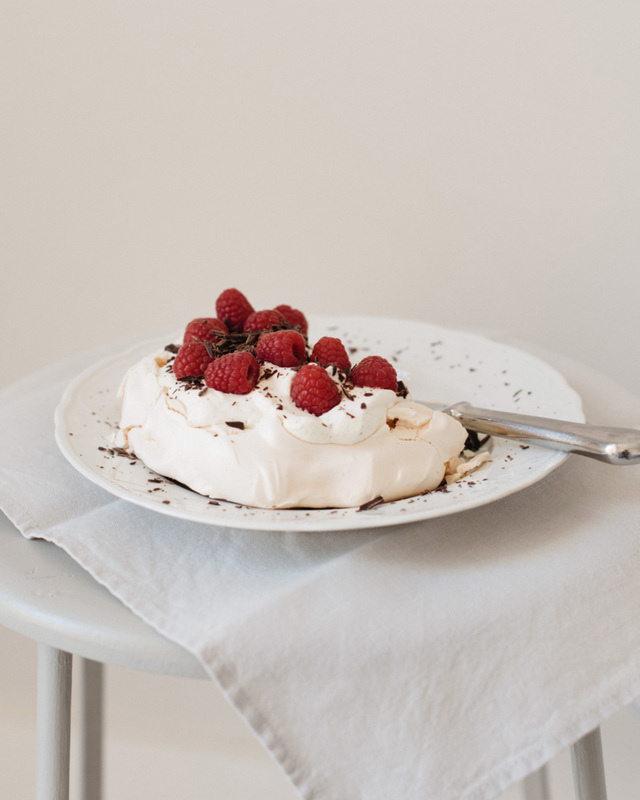 Named after Russian ballet dancer Anna Pavlova, this simple meringue cake is the sweetest dessert of the season. Heat oven to 125 °C. Whisk the egg whites with a hand mixer until it forms a fluffy foam. Whisk in the half of the sugar a little bit at a time and blend the other half with the cornflour before whisking it in. Continue whisking until the meringue looks glossy and stiff. Add the lemon juice. Using a pencil, mark out the circumference of a serving plate on baking parchment. Spread the meringue inside the circle, creating a crater by making the sides a little higher than the middle. If the meringue feels difficult to handle, try dipping your baking spatula in warm water. Bake for 70 to 90 minutes on low level and let cool completely before adding the filling. Dry meringue can be stored for several days in an airtight container in room temperature. As the meringue is quick to absorb moisture, the filling should be added right before serving. Whip the cream and mix in the vanilla bean powder. Spread over the meringue, put the berries on top and serve with great coffee.